"Raise your hand if you wanna hear some real early stuff!" A 1982 demo of Metallica plowing their way through Hit The Lights, later re-recorded for their 1983 debut album, Kill 'Em All, surfaced on YouTube a little while ago now. However, the comparatively low number of views suggests that plenty of the band's millions of fans haven't check it out yet. The lineup on this particular recording is an interesting one: in addition to James Hetfield and Lars Ulrich, it includes guitarist Dave Mustaine (whose days in the band were numbered) and bassist Ron McGovney. 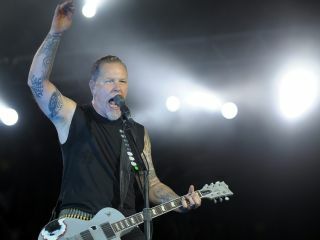 McGovney was Hetfield's childhood friend and onetime roommate, but frequent clashes with Mustaine led him to quit the band. He would be replaced by Cliff Burton. As one can hear on the demo (below), recorded in McGovney's garage, the basis of the song is there. And truth be told, Mustaine, who would soon be replaced by guitarist Kirk Hammett, acquits himself rather well - he plays with fire and passion. A neat little time capsule, to say the least. Demos of Whiplash and No Remorse that the band recorded for Megaforce Records from early 1983 featuring the Hetfield/Mustaine/Burton/Ulrich lineup (subject to much misty-eyed 'what might have been' speculation from fans over the years) can be heard here.